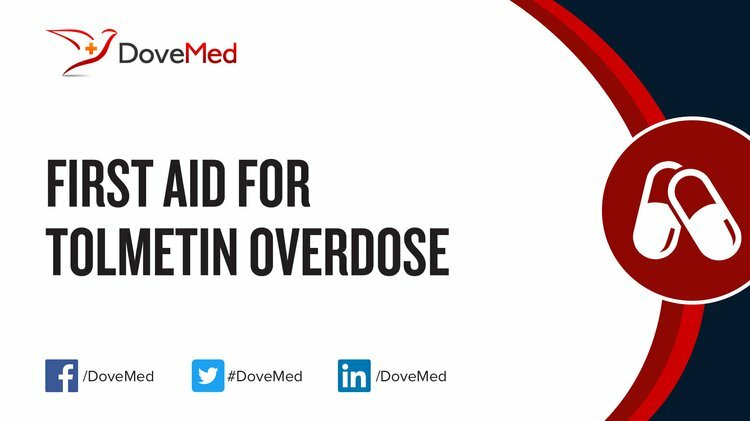 Tolmetin Overdose is the accidental or intentional intake of the drug in dosage higher than prescribed values. Tolmetin Overdose may be also referred to as Tolectin Overdose. What are the Causes of Tolmetin Overdose? What are the Signs and Symptoms of Tolmetin Overdose? The signs and symptoms of Tolmetin Overdose can vary from one individual to another. It may be mild in some and severe in others. Several systems of the body, such as the digestive system, nervous system, respiratory system, skin and ENT may be affected. How is First Aid administered for Tolmetin Overdose? Who should administer First Aid for Tolmetin Overdose? First aid for Tolmetin Overdose is administered by healthcare professionals. What is the Prognosis of Tolmetin Overdose? How can Tolmetin Overdose be Prevented? Howard, W. W., Kavesh, S., & Somma, R. F. (2015). U.S. Patent No. 9,211,292. Washington, DC: U.S. Patent and Trademark Office. Dykens, J. A., & Will, Y. (2010). Drug-induced mitochondrial dysfunction: an emerging model of idiosyncratic drug toxicity. Int Drug Discov, 5, 32-36. Eldor, J. (2013). Intratympanic bupivacaine instillation for tinnitus treatment?. Journal of Anesthesiology and Clinical Research, 2(1), 23. Bushra, R., & Aslam, N. (2010). An overview of clinical pharmacology of Ibuprofen. Oman Med J, 25(3), 155-1661. Liu, R., Yu, X., & Wallqvist, A. (2015). Data-driven identification of structural alerts for mitigating the risk of drug-induced human liver injuries. Journal of cheminformatics, 7(1), 4. Li, F., He, B., Liu, S., & Fan, C. (2013). Celecoxib effectively inhibits the formation of joint adhesions. Experimental and therapeutic medicine, 6(6), 1507-1511. Michniewska, A., Pikuzińska, P., & Pluta, P. NONNARCOTIC ANALGESICS, ANTIPYRETICS AND ANTIPHLOGISTICS. Wpływ wybranych związków chemicznych na organizmy żywe, 45. Carney, S., Wolf, C. E., Tarnai‐Moak, L., & Poklis, A. (2012). Evaluation of two enzyme immunoassays for the detection of the cocaine metabolite benzoylecgonine in 1,398 urine specimens. Journal of clinical laboratory analysis, 26(3), 130-135.